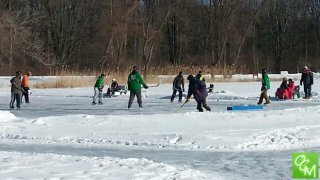 How to buy the right ice skates for kids – Ice skating is a fun activity that can be ruined by a pair of bad skates. There are some tips to follow that can help you pick out the best skates to make ice skating more enjoyable. I consulted the staff at the ONYX Ice Arena and here are their suggestions for how to buy the right ice skates for kids. Perani’s, located in the Onyx Ice Arena, specializes in fitting hockey skates but also carries figure skates. Jones Skate Shop, located at the Detroit Skating Club, specializes in fitting figure skates. Used skates can also be purchased at the Onyx-Suburban Skating Academy’s used dress and skate sale, which is held about twice a year. It is important that ice skates fit properly. Wear thin socks or tights to your ice skate fitting appointment to get the most accurate fit. Skate sizes will generally run one size smaller than street shoe size. When trying on ice skates, kick the heel back into the boot and lace up the ice skate. The foot should not slide around and there should be no big gaps anywhere in the boot. Remove the insole from the boot and place the heel at the back of the insole to check how much room is left at the toe. When looking for new skates, choose a pair that has an appropriate amount of support for the level of skating. Skates that are too stiff will not allow the skater to bend their knees and ankles, which is crucial in skating. Skates that are too weak, however, will not support the skater’s ankles. Big creases on the outside of the skate, usually around the ankles, indicate that the boot is broken down and may not offer much support. The “flop test” can be used to determine the amount of ankle support left in a skate. Hold the top of the boot, near the laces, and turn the skate sideways. If the weight of the blade causes the boot to bend down at a 90 degree angle, the boot is too weak. Some rust and nicks on the blades can be removed with sharpening, but not large amounts. Look for a blade in good condition. Perani’s, located in the Onyx. They sharpen both figure skates and hockey skates, but are especially good for sharpening hockey skates. Jones’ skate shop, located in the Detroit Skating Club. They specialize in sharpening figure skates. Fred’s Skate Sharpening, at the Onyx every other Friday. He specializes in sharpening figure skates and offers a recreational sharpening at a discounted price. Make appointments online here. Many skaters begin lessons in figure skates because the flatter and longer blades make learning to skate easier. 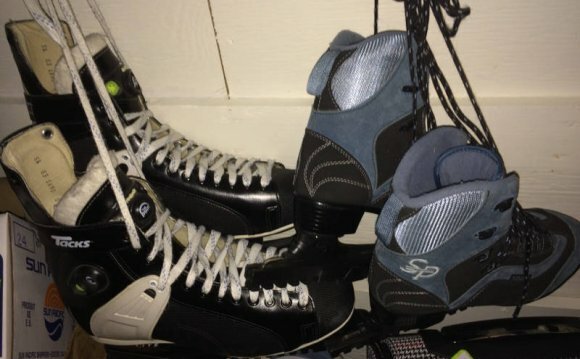 Often, skaters want to play hockey and are eager to switch into hockey skates. Skaters are generally ready for hockey skates when they start to gain speed and stability on the ice. Place the foot in the skate and kick the heel back on the ground. Leave the heel on the ground to tie the skate. Tie the skate as tightly as possible for the best ankle support. The laces should be pulled tightly through the instep and especially around the ankles. The laces should not move when a finger is run over them. Use all the hooks at the top of the boot.